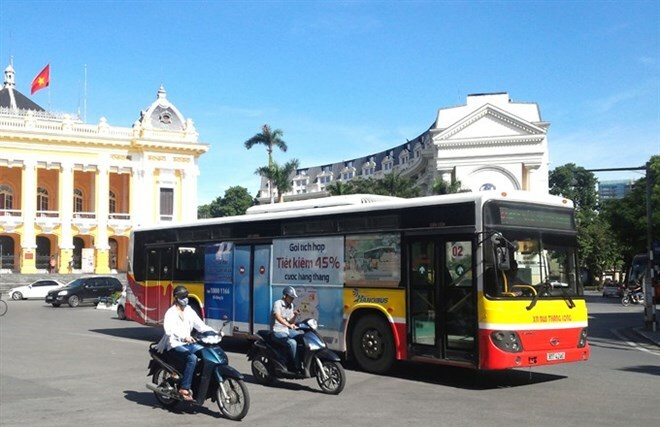 Hanoi (VNA) – Hanoi’s Transport Department and the Hanoi Transport Corporation have proposed to the municipal People’s Committee a pilot programme on using an electronic transportation cards on BRT route 01, connecting Kim Ma and Yen Nghia bus stations. Travellers using e-cards tap them on a sensor to pay and can top up their e-cards at every bus station on the route. This saves them having to purchase single journey tickets for every ride. The pilot programme is scheduled to run in September and October. Vu Van Vien, Director of the Transport Department, said the e-card would replace printed tickets, which are a waste of paper and money for the transport corporation. An estimated 2,500 e-cards are expected to be issued during the pilot programme, he said. The corporation plans to cooperate with the military telecoms group Viettel to install sensor systems on buses and at bus stations if the proposal is approved, he said. The installation cost is estimated at about 22.5 billion VND (990,000 USD). Nguyen Hoang Hai, Director of the Hanoi Urban Traffic Management and Operation Centre, said the e-card model will be implemented widely on the city’s bus system from 2018 after relevant agencies examine results of the pilot programme. Hai said the biggest challenge now was the quality of the sensor system. “The sensor equipment needs to be highly durable and stable,” he added.